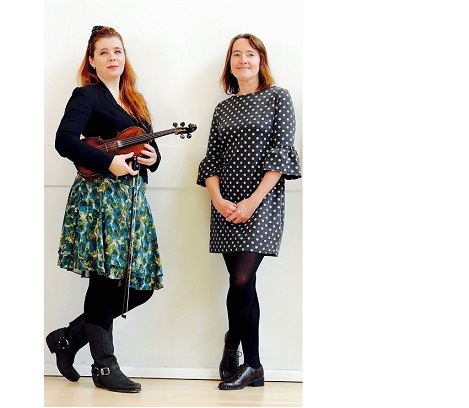 ‘Street Songs and Sea Shanties for the 21st Century’ with author Catherine Ann Cullen and musician Imogen Gunner is one of the three successful projects in this year’s Docklands Arts Fund Small Grants Scheme (2017). Catherine Ann Cullen is the A&L Goodbody Writer-in-Residence in St Joseph’s Co-Ed School, East Wall, working with the pupils there to foster a love of poetry, song and writing. She won the 2017 Allianz Business to Arts Award for Best Use of Creativity in the Community. Imogen Gunner is a fiddle player, multi-instrumentalist, singer, composer and arranger. She has recently performed at the Abbey Theatre, and her compositions featured in a BBC Radio 4 documentary about the Afri Famine Walk earlier this year. Their collaboration ‘Street Songs and Sea Shanties for the 21st Century’ aims to forge a new tradition of song-making in the Docklands area by giving the children in two primary schools the tools to collect local stories and ideas, and to hone them into communally-written songs. A series of four song-writing workshops delivered in two primary schools in the Docklands area, St Vincent’s Girls School and St Mary’s Boys National School, will culminate in a recital for both school communities, families and the wider community at a Docklands location.